In grappling with the geography of geopolitical conflict, many journalists, politicians, and military strategists use the term “arc of instability,” implying that the world’s troubled countries are arrayed along a curve. But different sources have very different ideas about how such an “arc” is configured. A recent The Wall Street Journal article (“Obama Contends With Arc of Instability Unseen Since ’70s”) expansively describes the zone of unstable countries as “playing out around the globe, from the Palestinian territories and Iraq to Ukraine and the South China Sea…” NATO’s Secretary General, on the other hand, looks at a somewhat offset region, contending that, “An arc of instability threatens states from the Middle East to North Africa and the Sahel…” A statement from the U.N. Security Council puts only “Africa’s Sahara and Sahel region” under this rubric. Yet according to political commentator Juan Cole, the term was used by the second Bush administration to refer to a region that pushes “deep into Central Asia.” Other writers, moreover, describe completely different “arcs of instability,” including one that is confined to Eastern Europe. 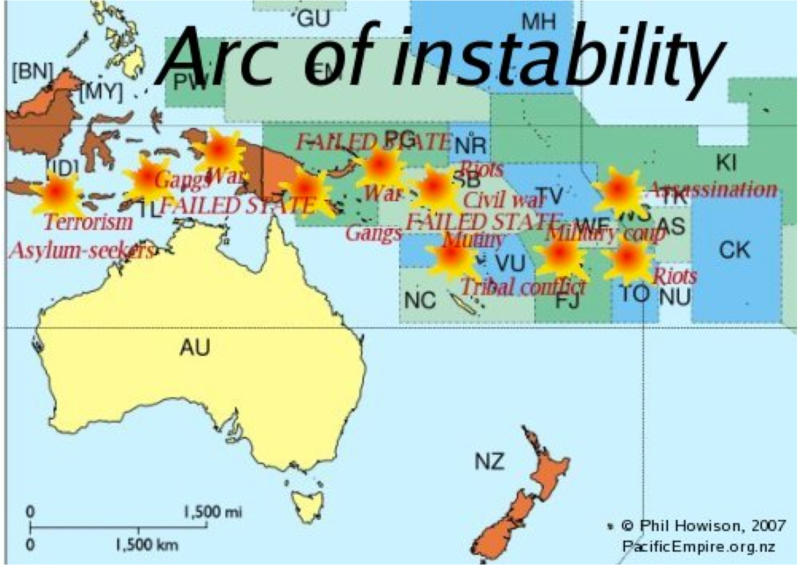 The Wikipedia article on “Arc of Instability,” however, tells us that the term “has traditionally been accepted to include South-East Asian and Oceanic nations such as Papua New Guinea, The Solomon Islands, East Timor, Indonesia and Fiji.” Evidently, the “arc of instability” is an extremely vague concept. Several sources attribute the genesis of the term to the National Intelligence Council. 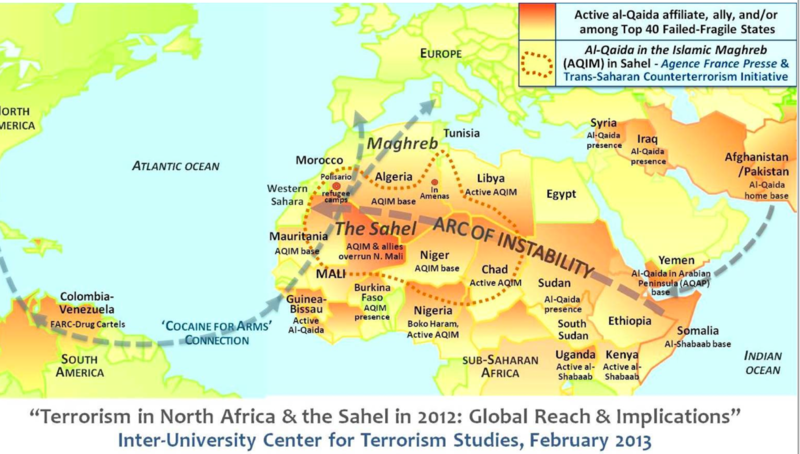 This organization’s 2008 report, Global Trends 2025, states (p. 61) that it had previously used the term “great arc of instability” to refer to an area “stretching from Sub-Saharan Africa through North Africa, into the Middle East, the Balkans, the Caucasus, and South and Central Asia, and parts of Southeast Asia.” This area is large indeed, but some maps show an even larger “arc,” such as the one posted to the left. This “mega-arc” stems from the idea of a “non- integrating gap,” proposed by Thomas Barnett in his 2004 book, The Pentagon’s New Map: War and Peace in the Twenty-First Century. 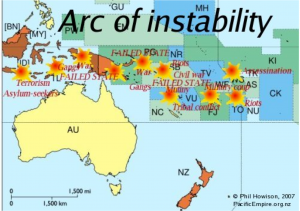 Does the concept of an “arc of instability” have any merit? Certainly the most enlarged versions of such a zone are of little use, as they include such relatively stable countries as Singapore, Malaysia, Mauritius, Romania, Costa Rica, and Panama. (By the same token, these and other supposedly “non-integrating countries” are actually highly integrated into the global economy.) Classifying half of the world as “unstable” is simply too crude to be helpful. 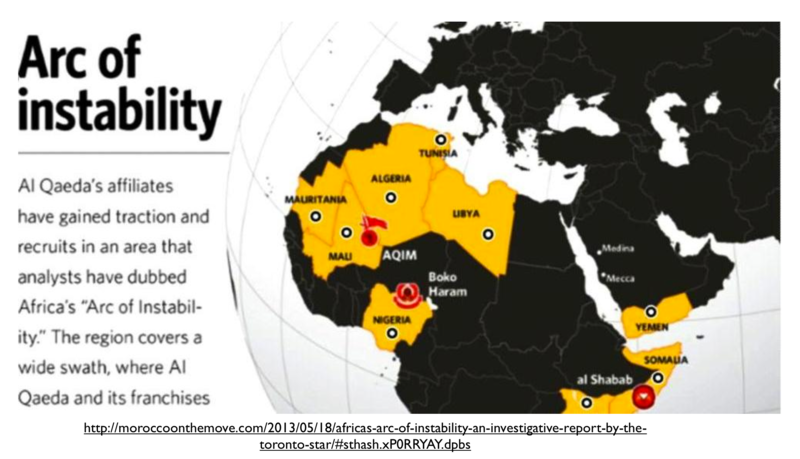 But that said, political instability is geographically clustered, and has become increasing clustered in recent years. 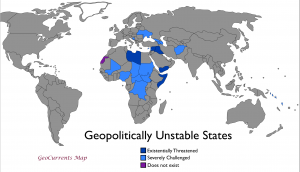 But before outlining the configuration of any such a zone, it would be useful to specify what exactly is meant by “instability.” In particular, we should differentiate a more superficial form of governmental instability from deeper geopolitical instability. Thailand, for example, certainly has an unstable government, but its existence as a state is not thereby threatened (notwithstanding the intractable insurgency in Thailand’s far south). Similarly, Venezuela is both governmentally and economically unstable, but no groups are demanding its dissolution or threatening to annex large chunks of its territory. The threats faced by such truly geopolitically unstable countries as Yemen and Libya, on the other hand, are much more extreme, as they are existential in nature. It is far from certain that Libya, let alone Somalia, will be reconstituted as a coherent state. With this distinction in mind, I have tentatively mapped a zone of genuine geopolitical instability. The countries in dark blue are deeply threatened and in some cases hardly exist as real geopolitical units. Lighter blue countries are geopolitically challenged in one way or another, generally by serious separatist movements or from territorially encroachments by neighboring states. Making such a map entails tricky judgment calls; as a result, suggestions for revisions are welcome. Should Pakistan be included? Does Sudan really belong? Such questions are not easy to answer. The basic patterns of the map are clear, however. 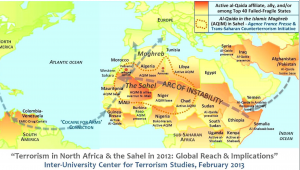 Geopolitical instability is concentrated in a zone stretching from Central Africa through North Africa and the Middle East and extending into the former Soviet region. The Americas and Southeast Asia are much more geopolitically stable, despite their depiction to the contrary on many maps. 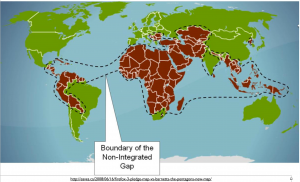 Geopolitical stability, moreover, has increased in recent years in such countries as Colombia, Peru, Burma, and Indonesia, while decreasing in much of North Africa and the Middle East.